SMITHFIELD, Va., Jun. 07 /CSRwire/ - The Smithfield Foundation, the philanthropic arm of Smithfield Foods, Inc., recently announced a $25,000 donation to the Chesapeake Bay Foundation (CBF). The gift will support CBF’s environmental education programs in Virginia, providing opportunities for students and teachers throughout the state. This donation will help CBF’s award-winning environmental education programs reach more than 13,000 teachers and students in 4th through 12th grade in Title 1 schools across the state. Programs include Field Experiences that take students outside to explore the Chesapeake Bay watershed and learn how they can take action to save and protect the Bay. It also funds Teacher Professional Learning programs that focus on methods to incorporate environmental education into the core subject areas of reading, math, science, and social studies. Stewart Leeth, vice president of regulatory affairs and chief sustainability officer for Smithfield Foods and vice president of the Smithfield Foundation, presented the donation to CBF staff and students during an environmental education field experience at the Brock Environmental Center in Virginia Beach, Virginia. 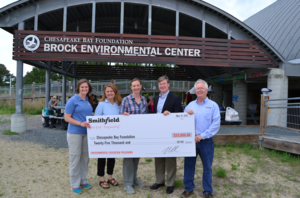 This donation aligns with Smithfield’s efforts to support the vitality of local communities through education, and with the company’s continued environmental efforts and initiatives. Smithfield’s industry-leading sustainability program is focused on five pillars: animal care, environment, food safety and quality, helping communities, and people. To read more about these efforts, please visit smithfieldfoods.com/2017report. Smithfield Foods is a $15 billion global food company and the world's largest pork processor and hog producer. In the United States, the company is also the leader in numerous packaged meats categories with popular brands including Smithfield®, Eckrich®, Nathan's Famous®, Farmland®, Armour®, Farmer John®, Kretschmar®, John Morrell®, Cook's®, Gwaltney®, Carando®, Margherita®, Curly's®, Healthy Ones®, Morliny®, Krakus® and Berlinki®. Smithfield Foods is committed to providing good food in a responsible way and maintains robust animal care, community involvement, employee safety, environmental and food safety and quality programs. For more information, visit www.smithfieldfoods.com.